American Wolf: Greatest Hits: The Columbia Model. The Ultimate Greatest Hits Muse. I wish I could say that my introduction to Bob Dylan was Highway 61 Revisited or Bringing It All Back Home, but it wasn't—it was a cassette dub of my parents' Bob Dylan's Greatest Hits LP. Clocking in at just over 40 minutes, it conveniently gathered all 7 of Dylan's Top 40 singles of his peak period (1963-1966), buttressed by 3 tracks from his best 3 acoustic folk albums. The songs were mixed out of chronological order such that "Rainy Day Women #12 & 35" sat next to "Blowin' In The Wind," but no matter. In terms of quality, logic, and focus, there has never been a finer collection of Dylan's music. If there ever was a "Greatest Hits" sweepstakes in rock & roll, it would surely have to be won by Columbia Records. 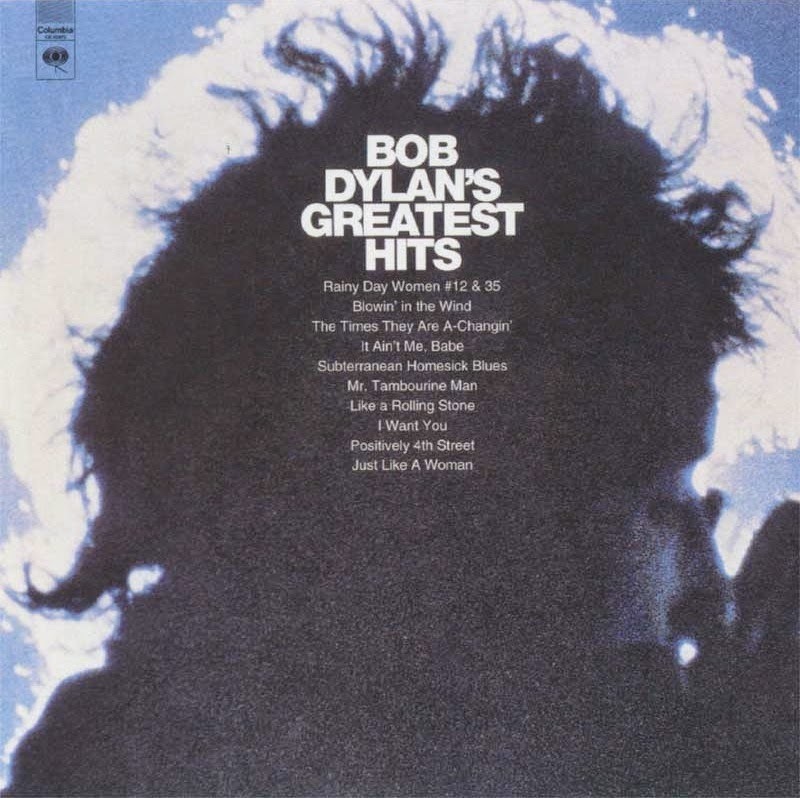 In the wake of Bob Dylan's Greatest Hits came greatest hits LPs from The Byrds, Sly & The Family Stone, & Simon & Garfunkel—all so fine that they would make Rolling Stone's Essential 200 list in 1997, beating out the likes of albums like The Byrds' Mr. Tambourine Man, Sly Stone's Stand!, and Simon & Garfunkel's Bridge Over Troubled Water. (A fourth, Janis Joplin's Greatest Hits, should've been included, but she was inexplicably left off the list entirely.) Each packed a punch that summarized the artist's era better than the best of the era's original albums themselves. 1. A relatively short (read: 1 LP) running time. 2. Most (if not all) of the artist's Top 40 hits. 3. Sequencing in a non-chronological order. 4. A timespan covering at least 4 years or 4 albums. One of the frustrations of the post-CD era is album length. Many of the best rock & roll albums come from the era before CDs, in part because rock is best heard in a 30-to-40-minute rush. (Indeed, even many of the classic post-CD era albums—The Strokes' Is This It, The White Stripes' White Blood Cells, Neutral Milk Hotel's In The Aeroplane Over The Sea, & Arcade Fire's Funeral—comfortably sit within a single vinyl record). Furthermore, there is something about the whole "everything you need in the length of a single vinyl record" that has been all but lost in the past few decades. Nirvana lends itself so easily to the Columbia Model format because they had such few hits & the ones they had were somewhat shorter in length (they are the only group to have 12 songs instead of the usual 10). Included here are all 3 of their Top 40 singles (including "Pennyroyal Tea," which hit #1 as a special release earlier this year on Record Store Day), as well as all of their songs in the original versions, with the exception of "All Apologies," which is taken from MTV Unplugged In New York, which is generally considered the better version. Ironically, it is the incompleteness of Nirvana's career that makes their greatest hits album feel the most complete. R.E.M. 's 30-year career was proving to be tricky until I realized that all of their 9 Top 40 hits fell within a 5-album period. Once I realized that, this album fell together pretty easily, as it is a mix of these 9 songs, plus their next most recognizable song ("End Of The World"), which also falls in this period. & just out of curiosity, what does R.E.M. have against "Drive"? They've left it off of both of their Warner Brothers-era compilations, even though it was technically the biggest hit from Automatic For The People in their native country. For U2, I went with the 5 album span from War to Achtung Baby, easily their finest era. I also went for anthems over hits; the now largely-forgotten "The Fly" may have hit #1 in the UK (#61 US), but "Sunday Bloody Sunday" (released only as a single in Germany & the Netherlands) is the song that anyone off the street could sing for you. It also would have been nice to include their remaining 2 US Top 40 hits—"Angel Of Harlem" (#14 US, #9 UK) & "Who's Gonna Ride Your Wild Horses" (#35 US, #14 UK), but they ultimately diluted the punch, as well as give Achtung Baby one more song than The Joshua Tree, a balance I would not want to upset. This contains all but one of Radiohead's UK Top 40 singles & all of their US Top 100 singles from this period. Only "Anyone Can Play Guitar" (#32 UK) is left off because it is slighter than the others & I wanted to the collection to span at least 4 studio albums; in its place is "Everything In Its Right Place" from Kid A, which Thom Yorke is on record as regretting not releasing as a single. This allowed for a proper time span & balance of material, even if not every Top 40 hit of their native country was represented. There's a certain level of absurdity in trying to shoehorn modern rock groups into the archaic Columbia Model, & no band showed this better than Pearl Jam. (Ironically, they are the only group on the list signed to a Columbia subsidiary, Epic.) All of their US Top 40 hits were recorded within their first 5 albums—as well as all but 2 of their UK Top 40 hits (#30 "Wishlist" & #34 "Not For You" failed to make the cut)—but this barely hints at the bigger picture. Album cuts like "Elderly Woman Behind The Counter In A Small Town" (from Vs.) & "Corduroy" (from Vitalogy) are just as recognizable as many of the tracks above, while non-singles like "Black" (which the band refused to release as a single, despite pressure from their label to do so) & "Yellow Leadbetter" (a B-side to "Jeremy") usually rank among their finest masterpieces. If any band shows why the classic format might no longer work in the CD era, it's Pearl Jam; it is probably no coincidence that they are the only band on this list to never release a best-of album that was smaller than a double CD.